These area students will soon be singing in Europe with the 250-voice Nebraska Ambassadors of Music. 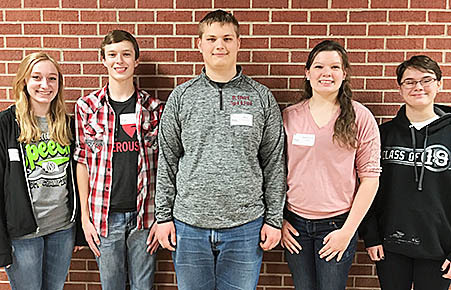 Six area high school students (five shown above), l.-r, Olivia Groeteke, Scott Wright, Roy Cummings, Stephanie Wright and Maya Baker, along with Cameron Nielsen of Pope John (not pictured) will travel to Europe June 9-24 with the Nebraska Ambassadors of Music. They will perform concerts in England, France, Switzerland, Liechtenstein, Austria, Italy and Germany. Michele Wright, vocal music instructor at Boone Central and an NAM staff member, will also be traveling with the group. A bon voyage concert will be at 5:30 p.m. June 8 at Fremont Middle School.